Being with my 3 children and hubby doing anything! Hanging out with my friends and my family wodding, boating, skiing and travelling. My family and friends who push me to do better and are there for me when I am not there for myself! 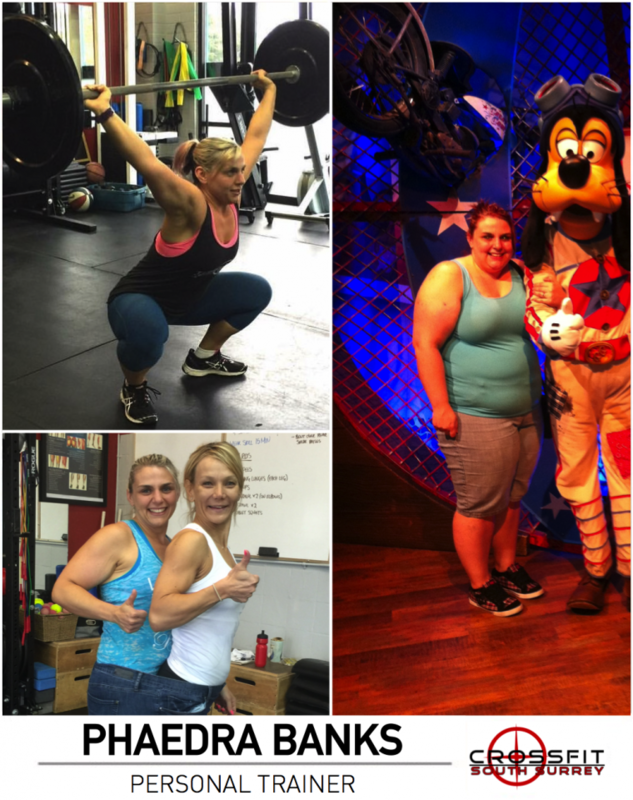 My clients who work so hard to change and do it! Working with members, kids, teens and adults and knowing that I have helped a few people everyday be pain free, fat free, increase athleticism and build self confidence. Watching the amazing athletic changes from the kids, tween, teen and their fitness level increase, all with big smiles on their faces! 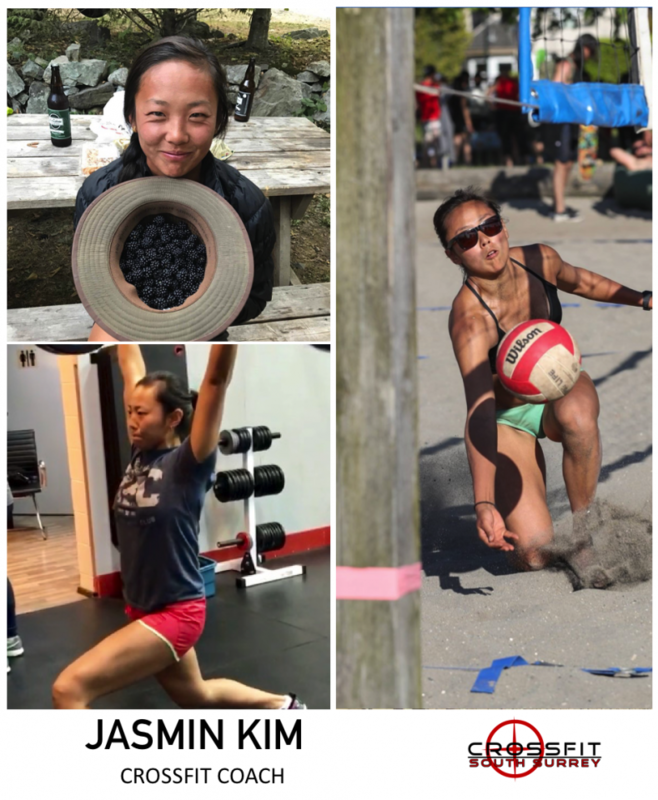 Biggest thing is to help someone in pain or achieve in their minds the unachievable …like a rope climb, beginner mud run, more mobility, less pain, great eating plan. I love to take the guess work out of peoples lives so they can focus on the other things…. LOVE MY JOB!!! Sheana graduated from the University of British Columbia in 2003 with her Bachelor of Science in Physiotherapy. Since then, she has been working full-time in private practice. Sheana has also studied physiotherapy in New Zealand, has worked as a physiotherapist in the United Kingdom, and has worked part-time in hospital settings. Sheana has a special clinical interest in chronic/persistent pain, orthopaedic, manual and sports physiotherapy. Sheana has obtained her IMS certification and her Diploma of Advanced Manual and Manipulative Physiotherapy, and she focuses much of her current continuing education endeavors on the treatment of chronic/persistent pain. Sheana has been a competitive ballet and modern dancer since she was five years old and now she also enjoys yoga, hiking, skiing, biking, and swimming. Sheana is also a clinical placement instructor for physiotherapy students, and she is a mentor for internationally educated physiotherapists. Matt completed his Masters in Physical Therapy from UBC after receiving a Bachelor of Human Kinetics from UBC Okanagan. 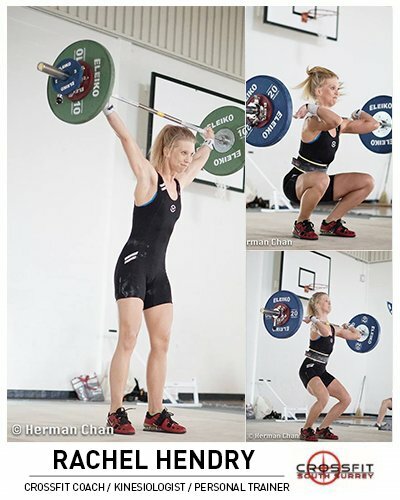 He pursued a career in physiotherapy after broadening his experiences in Australia, where he developed his skills in strength and conditioning coaching and rehabilitation techniques. Matt has worked in private practice, critical care, neurological rehab, and has taught spinal cord injury management in rural India, and presented at the sports medicine conference in Honduras. Matt is committed to providing the best care and support to patients, allowing them to return quickly to the lifestyle and activities that they enjoy most. Matt uses a treatment approach specializing in manual therapy, movement training, exercise prescription, and client education to help his clients achieve their goals. Matt has a passion for the outdoors and loves to adventure with his family and friends while hiking, mountain biking, running marathons, mountaineering, snowboarding, waterskiing, and kayaking. 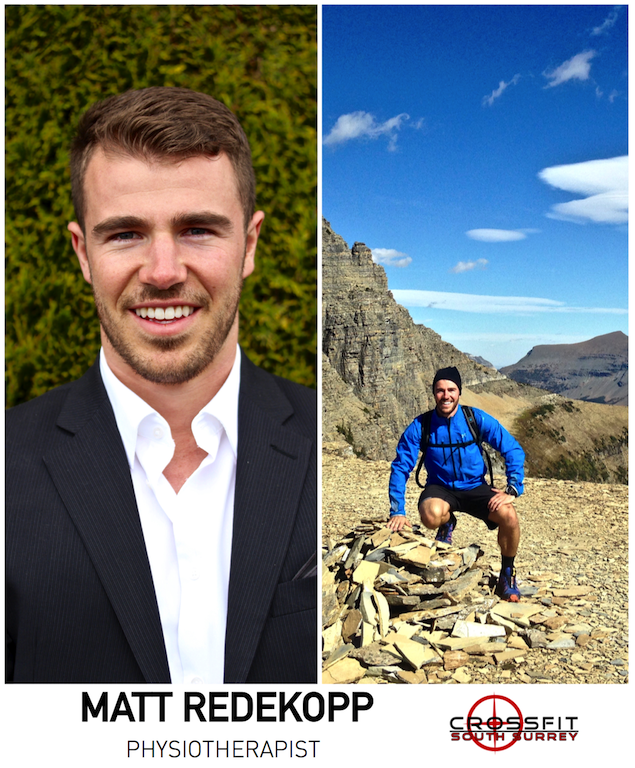 Matt has grown up competing and coaching in high-level soccer and track & field, and has his sports first responder to care for athletes in both pursuits. Emily Schat has an enormous amount of enthusiasm for life, health, wellness and the great outdoors. Emily is an athlete in her own right and spends as much time as she can at the gym. Emily is also a volunteer with Search and Rescue team so you know you’re in good hands! Emily studied massage therapy at the West Coast College of Massage Therapy. 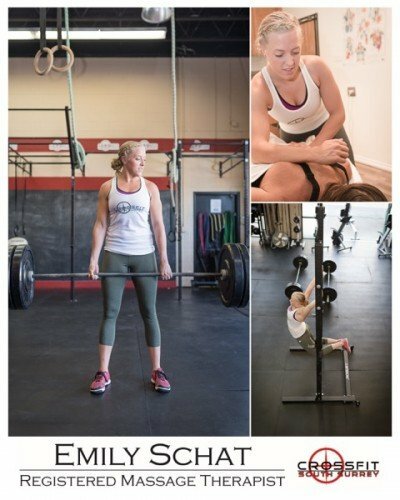 Emily is our in house RMT, treating right out of CrossFit South Surrey and is eager to work with each and every one of you! BOOK TODAY for a Relaxation Massage, which will include: Consultation, assessment, treatment and re-assessment. Watching people accomplish their fitness goals and knowing I was a part of that! When people push through obstacles, physical or emotional, to achieve their goal! Elderly people who don’t let their age act as a barrier to achieving their fitness goals!